Wild Exhilaration – Peaceful Relaxation – Challenging Exploration – Spiritual Meditation: All In One Trip. Pictures and stories do not fully explain this rafting trip. You really have to experience it yourself to fully understand what everyone is talking about. 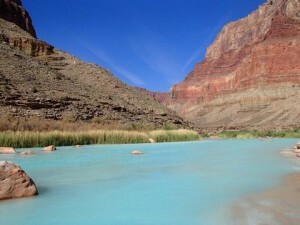 From the early instructions about what to bring and not bring, to the lessons on how to manage your equipment, to the trip down the Colorado River; Western River Expeditions' staff and guides make this trip possible for most anyone. You can find friendship or solitude, splashy thrilling rides or enjoy the river from a "dryer and calmer" place. You can eat as little as a peanut butter sandwich or go back for seconds on a delicious complete dinner. Choose to sleep in tent or out under the stars. Join in fantastic hikes which bring you to places most people will never see, or stay back and enjoy the sounds of the river. I learned about the Native Americans who settled in this area. I body surfed in the most beautiful turquoise waters. I stood under rushing cold waterfalls and watched others take a plunge! I pondered how the moon could be so bright and then enjoyed the plentiful stars! I marveled at how the air was hot yet comfortable because it is dry. I amazed myself by swimming and bathing in icy cold water yet finding it adventurous and fun. The plane rides and helicopter ride were awe inspiring. For a far as the eye could see- I saw the canyon and was amazed at its vastness, its ever changing color and the variety of its texture. To see the lakes and rivers from up above was a treat. The trip brought our friendships closer and gave us a chance to meet new and interesting people as well. This is a trip which I will treasure forever and have already encouraged others to add it to their list of must see/must do.